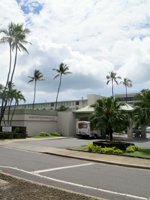 Honolulu Hotels: A Local Resident’s Perspective. 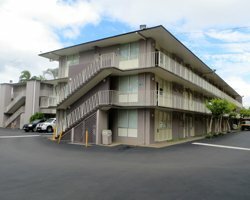 Finding Honolulu Hotels... A Resident's Perspective! 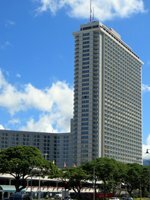 You might want to stay at one of these Honolulu hotels (close to businesses and/or the Honolulu Airport) if you’re going to be on Oahu for work or just a layover. Although Waikiki is, technically, still part of Honolulu, I’m talking specifically and exclusively about the hotels that are outside of Waikiki and within the commercial part of town. Interestingly, when visitors first started arriving on Oahu, the major hotels were primarily located downtown (near the port where the ocean liners arrived); and there were only two or three Waikiki hotels. Times have changed, though, and now you’ll find the Honolulu hotels to be more scarce. The City and County of Honolulu covers the entire island of Oahu. So if you do a random internet search for “Honolulu hotels” you could get results anywhere on the island. 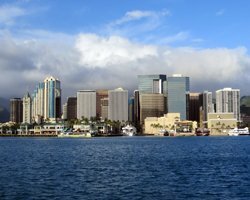 This page will keep you in the Honolulu metropolitan area. For starters, you should know who I am so you can understand my perspective. If you’re familiar with the rest of my site, you know that I’m a long-term Oahu resident who likes living as if I’m on a family vacation in Hawaii. Nevertheless, on Oahu, I sleep at home – not in an Oahu hotel. Nor do I work for any of the Honolulu hotels that I’m discussing. So my perspective is unbiased, but it’s also a bit uninformed when it comes to specific details about most of the guest rooms (although I have been in the guest rooms at a couple of these hotels). I have, however, been to some of these Honolulu hotels for meals, entertainment and various events. So I think that qualifies me to give a somewhat objective and informed opinion about how a visitor might look at these Oahu lodging options for the first time. Thus, I’ll be discussing the purely external factors that might affect where you want to stay. I’m only attempting to help you point yourself in the direction you prefer. Then it will be up to you to thoroughly research the hotels that interest you most and read guest reviews, etc. If you arrived on this page as the result of a random internet search for Honolulu hotels, but you’re actually looking for an Oahu vacation resort, click on any of the following links to read about Waikiki Beach hotels, other off-beach Waikiki hotels throughout northwest, central, and southeast Waikiki, Aulani, and other beachfront Oahu hotels. 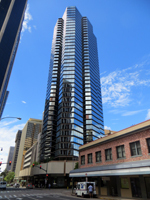 These Honolulu hotels are located within approximately 1 km (0.6 miles) of the Honolulu International Airport (HNL). As a result, they are ideally located for a short layover, business at one of the Honolulu military installations (Joint Base Pearl Harbor/Hickam, Camp H.M. Smith, Tripler Army Medical Center or Fort Shafter), the NFL Pro Bowl or any other event at Aloha Stadium, the Prince Lot Hula Festival at Moanalua Gardens, or any other activity/event in the central Honolulu area. They are nowhere near the beach, though. The closest public beach is located on Sand Island (and that’s not within walking distance). Check Rates and Availability at Hotels.com (ad): Click Here for the Best Honolulu Hotel Deals! Search keyword "Airport Honolulu". This hotel was once branded as an Ohana hotel, but it seems to have recently dropped the Ohana name while still falling under the Outrigger/Ohana umbrella. I don’t fully understand the current management arrangement; and you probably don’t care unless you have a preference for the local Outrigger brand of hotels. As a result, however, this airport hotel seems to feel the most “Hawaiian” in its décor. The hotel is the largest of the three airport hotels, and it has a nice swimming pool. It’s located along Nimitz Highway in front of the Airport in the shadow of the H1 freeway (literally… this photo was taken next to the base of a freeway support column). Check Rates and Availability (ad): Save Now on Hotel Rooms Worldwide! : search keyword "Honolulu International Airport". The Best Western Plaza Hotel is also located along Nimitz Highway in the shadow of the H1 freeway. In fact, you can see the freeway running through the upper right corner of this photo. It’s that close. This is the second-largest of the three airport hotels, and it has a small but nice swimming pool. I’ve been to this hotel a few times for parties and/or the buffet dinner; but I’ve never stayed there as a guest. I have, however, talked to many different military service members who stayed temporarily at this hotel while awaiting a housing assignment. I don’t recall hearing any complaints from them. Check Rates and Availability at Hotels.com (ad): Click Here for the Best Honolulu Hotel Deals! Search keyword "Castle Pacific Marina". Yes, this hotel is close to the airport; and, yes, it’s cheaper than the others. But before you decide to book a room here, I’m going to urge you to look up this property’s address using google maps and the street view feature. This hotel is located on a side street and surrounded by industrial warehouses. It’s also located adjacent to a major park; so there’s nothing wrong with this location per se. Nevertheless, I urge you to consider whether you will be comfortable there after dark. If you feel good about what you see, click the link I provided above, and you can research the specifics as you make your reservation. Some additional information that might help… 1) it has a small but well-maintained pool; 2) it has an on-site restaurant; and 3) I was able to peek in some of the guest rooms while the maids were cleaning them, and the the rooms I saw were quite small. I wouldn’t want to try to fit a family of four in there. HINT: Before you arrive at any Honolulu hotels, you may need to figure out your airport transportation situation back home. I’ve recently come across a couple of great resources that could help you save a small fortune on airport parking… If you just need to park your vehicle for the duration of your Hawaii vacation, try this (ad): Save On Airport Parking At Over 65 US Airports . They say they can save you up to 70%. Or, depending on your distance from the airport and the times of your flights, you might want to overnight in a hotel near your airport. If that’s your situation, this seems to be a fantastic deal (ad): Reserve Airport Hotel for One Night & Get Up To 21 Days of Parking for FREE! Unfortunately for me, neither of these services are available at the Honolulu International Airport, but that shouldn’t stop you from saving some cash! Check Rates and Availability at Hotels.com (ad): Click Here for the Best Honolulu Hotel Deals! Search keyword "Ala Moana Hotel". This hotel is attached to the Ala Moana Shopping Center, which is the biggest shopping mall in Hawaii. That could be good or bad… depending on your perspective. It’s conveniently located one block from the Hawaii Convention Center, one block from the beaches at Magic Island/Ala Moana Regional Park, and one block from the western edge of Waikiki. And it’s the home to one of the island’s oldest and most popular night clubs. I’ve never stayed there as a guest, but I’ve been to countless ballroom events at this hotel. Basically, it’s a nice hotel in a great location. I found cheaper rates for this hotel at Hotels.com (ad). Click Here for the Best Honolulu Hotel Deals! Search keyword "Aston Executive Centre". If you’re on island for business in the middle of Oahu’s downtown professional district, none of the Honolulu hotels will get you closer to your work than the Aston at the Executive Centre. The building itself is a hotel and condominium complex with various commercial and retail businesses that also lease space. It’s not by the beach. It’s not next to the shopping mall or convention center or Waikiki. It’s within a few minutes drive or bus ride of all those things; but this hotel’s primary advantage is its convenient location smack in the middle of all the big bank headquarters, advertising agencies, law offices, accountants, and other such professionals. It’s just two to five blocks from the courthouses, and about the same distance to the Hawaii State Capitol and government buildings. That means the area is bustling during the work-week and practically deserted at night and on the weekends. I’m not saying you can’t vacation here… but I doubt you’ll see many other people walking through the lobby in their swimsuits and inflatable floatation rings. And you’ll probably have to find your way out to other areas for weekend/evening food and fun. Check Rates and Availability at Hotels.com (ad): Click Here for the Best Honolulu Hotel Deals! Search keyword “Pagoda Honolulu”. 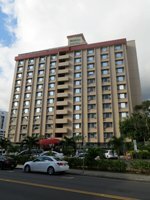 The Pagoda Hotel is located three blocks inland from Ala Moana Shopping Center, five blocks from the Hawaii Convention Center, and approximately seven blocks from the edge of Waikiki and the beaches at Magic Island/Ala Moana Regional Park. Meanwhile, it’s only one block from Walmart and Sam’s Club. There are a handful of liquor stores and adult entertainment clubs in the surrounding area (but significantly fewer than there used to be 20 years ago). At present, I would describe this area of Honolulu as being on the up-swing of ongoing re-vitalization. If you’re at all concerned about the location, just search the address on google maps and use the street view feature to see the surrounding area for yourself. You’ll probably conclude that although it’s clearly not Waikiki beachfront, it’s not bad. Furthermore, this hotel has a very popular “floating” restaurant where probably everybody on this island has eaten at one time or another. Personally, I’ve been to the Pagoda Hotel many times for the restaurant or for ballroom events. Check Rates and Availability at Hotels.com (ad). Hawaii Vacations: Save 30% or more in paradise! : search keyword "Manoa Valley". 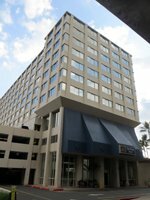 I’m reluctant to include the Manoa Valley Inn among these downtown Honolulu hotels because it’s located on the outskirts of Honolulu, and – in many respects – it appears to be a bed and breakfast. This turn-of-the-century bungalow-style home offers more than 100 years of charm; and it’s listed on the National Register of Historic Places. Like a B&B, it has only seven guest rooms, children under the age of 12 are not allowed, and rates include breakfast. Nevertheless, this place calls itself an inn, and it seems to offer more comforts and amenities than I normally expect from a B&B. 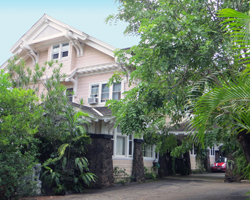 Though not in the middle of town, it’s in a great location across the street from the University of Hawaii main campus. It’s only 10 minutes by car from Waikiki; and it puts you in proximity to Hawaii attractions such as Manoa Falls and the Lyon Arboretum, Waahila Ridge and the Mu-Ryang-Sa Buddhist Temple. *Sample room rates reported above are in $US and intended only as a snapshot of the rates published directly by the various hotels using their online booking tools in March 2014. They are provided exclusively for the purpose of convenient seasonal comparison. Rates are per night for two adults in one standard guest room at the lowest non-promotional price. Rates were obtained for the following dates in 2014: April 15-21, July 15-21, and October 15-21; and rates were also obtained for the following dates in 2015: January 15-21. Rates marked as NA were not available for the requested dates. The rates published here are only samples based on my research on a single day in March 2014. They do not represent a price guarantee or quote to you. You must still obtain you own hotel pricing information based on your booking/travel dates.